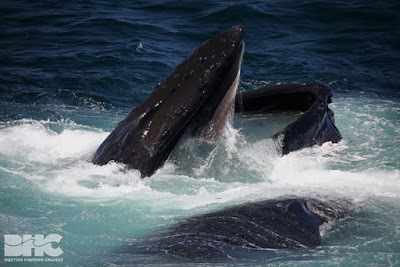 Our Sunday whale watches were the type of trips that we as naturalists live for. The influx of activity on Stellwagen Bank has brought 60+ humpback whales to the area and a range of other species. As we made it to the eastern edge of the bank on our first trip, we immediately spotted a long line of bubble net and kick feeding whales extending north to south for maybe a mile. 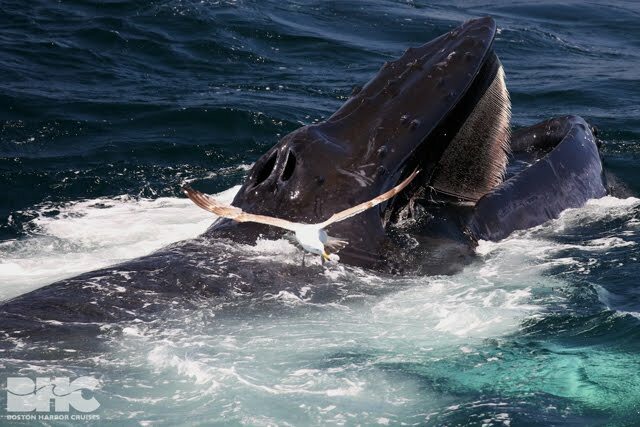 As Captain Chip slowly maneuvered the boat into the vicinity, we quickly found ourselves enveloped by humpbacks as they corralled large schools of sandlance to the surrounding surface waters. 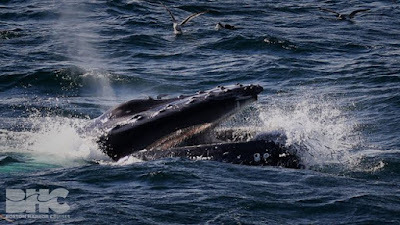 Among these whales included Timberline, Rapier’s 2009 Calf, Lavalier, Rune, Ventisca, Alligator, Landslide, Flock, Greenbean, Pepper, Habenero, as well as three mothers (Dusky, Mars, Entropy), and each of their calves. Our afternoon brought more feeding and a new round of active calves! Wizard’s calf quickly captured our attention with repetitive breaching (see top photo), while mom fed alongside a humpback named Ursa. Music’s calf also made an appearance on our afternoon whale watch! This young whale paid extra attention to us, checking out the boat while mom fed on her own. 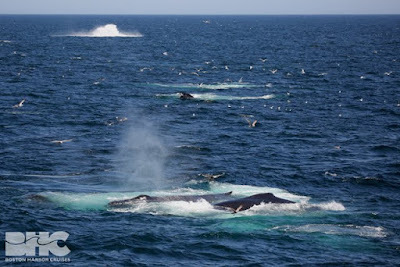 Nearby humpbacks included Mayo, Apex, Lavalier, and Ventisca. Birds everywhere, even on top of the whales! 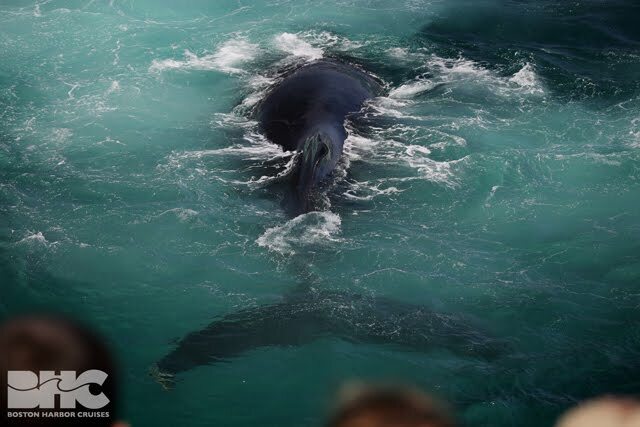 By the afternoon, fin whales and minke whales had joined in on the feeding frenzy and were seen feeding alongside hungry humpbacks. Meanwhile, birders enjoyed a bird paradise as we observed throngs of sooty, great, manx, and Cory’s shearwaters partaking in the feast! What a fantastic day on the water! With a slight shift in wind, there was a bit of a haze over Stellwagen today. 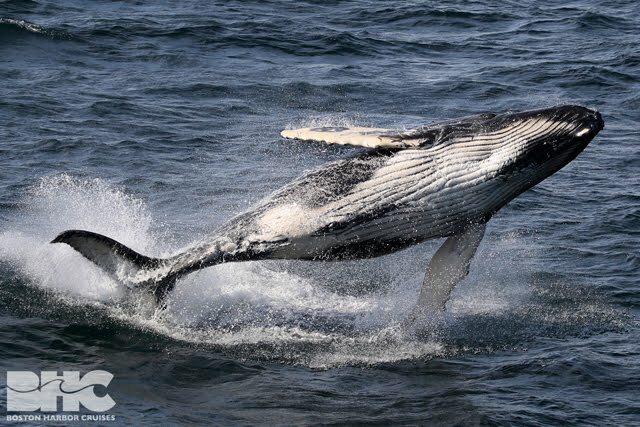 Nonetheless, we made our way south and were confident that we would find whales, hopefully in the large numbers that we have been seeing. We began with one juvenile, slowly drifting beneath the surface, likely resting. From there we could see multiple groups of whales, and slowly made our way to each of them. Today’s sightings did not have the multiple groups of kick feeding whales, instead today they were milling around in groups of 3-4, with at least two calves in the area. We watched Bolide, Bowline, and Whiplash, along with Twine and her calf. The calf even became a bit curious and spent much of its time waiting for mom to resurface just off our port side! In addition, we also had a curious young seal come to take a look at the passengers on board. It was a great day, and so good to see the whales hanging around nearby!